How Trump made a fool out of Mexico. President Enrique Peña Nieto committed an historic error. Mexican President Enrique Peña Nieto and Donald Trump shake hands at Los Pinos presidential residence in Mexico City on Wednesday. It was a theatrical work with two simultaneous performances. One was staged against the scenery of the American campaign for president; the other unfolded within the Mexican political arena. There were two actors: candidate Donald Trump and President Enrique Peña Nieto. Trump was trying to soften his image with undecided American voters and perhaps persuade some Latino Americans to support him, to see him as presidential and friendly toward Mexicans, all without alienating his committed followers and all while not yielding an inch on his wall and deportation agenda. Peña Nieto, more unpopular in his country than Trump is in his, was trying to “protect” Mexicans in Mexico itself and in the United States. 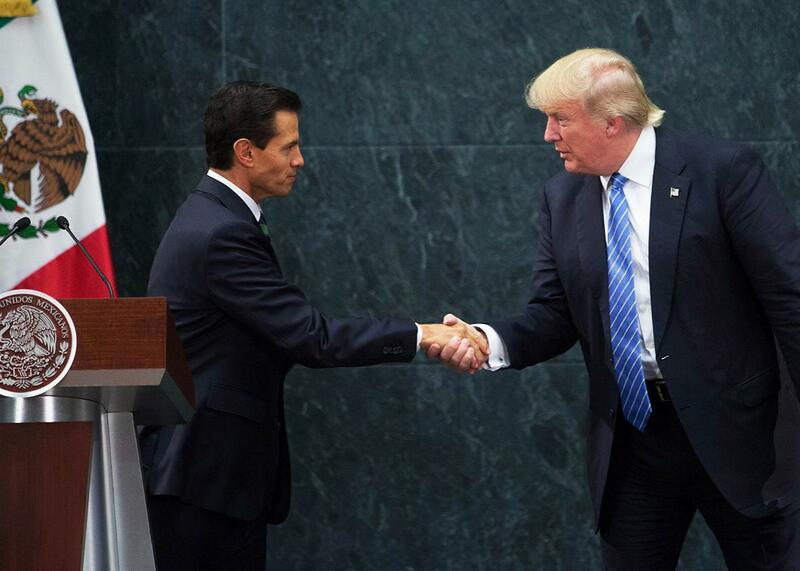 There was only one winner, Donald Trump, and one loser, Peña Nieto. Or, more precisely, Peña Nieto and the people of Mexico. Trump calls himself a great negotiator. On this particular occasion, he was. He chose the moment, the script, the terminology, even the questions. And, as usual, falsehood and fakery were his weapons. He spent 10 hours with Mexico (including his flight time) and secured the appearance of support from the country’s president (not explicit but, for Trump, usefully symbolic). Having fitted himself for a halo as a friend of Mexico, Trump could then return to euphorically address his faithful supporters in Arizona, reiterating word for word his racist and anti-immigrant proposals, beginning with the construction of “a big, fat, beautiful wall” that Mexico will pay for. After all, hadn’t he just shaken hands, that very afternoon, with his “friend,” the president of Mexico? Peña Nieto, onstage with Trump, delivered a sober speech about commerce and emigration, a factual discourse that neither convinced nor made a minimal emotional impression on Trump, who is a post-factual politician. For him, objective truth does not exist. Truth for him is whatever he happens to be saying at that particular moment. Peña Nieto should have publicly expressed his absolute refusal to pay for Trump’s absurd wall. In a tweet after the fact—fortunately picked up by the American press—Peña Nieto stated that he had, at the beginning of Trump’s visit, told him in private that Mexico would never pay for a wall. (A revelation of yet another one of Trump’s endless lies, since he claimed in their joint appearance afterward that there had been no discussion at all of how his pet wall would be financed.) But why did the Mexican president not bravely affirm his position in public? And why did he agree to this meeting at all, on the day before the presidential informe (a state-of-the country address), delivered on Sept. 1 , a key date in Mexico going back to 1917. Why did he have to schedule this meeting in the afternoon preceding Trump’s anti-immigrant tirade in Arizona? We Mexicans are raised to value a kind of public courtesy, often pro forma and sometimes florid, surely the genesis of a statement like Peña Nieto’s calling Trump a friend. Did he really think that traditional (in this case banal) Mexican courtesy would soften Trump’s message directed at the most bigoted of his supporters? Trump came to Mexico to offer some supposedly laudatory words about we Mexicans whom he has spent his whole campaign insulting. Now we were “tremendous people.” And in exchange for these miserable crumbs of vacuous content, he was given a presidential treatment, incidentally alienating Hillary Clinton, a candidate who does understand and respect Mexico, who in her phrase wants to build bridges not walls (and whose husband literally saved Mexico from bankruptcy in 1995). Donald Trump is a sociopath drunk on himself. His religion is hatred. His god is Donald Trump. He is also addicted to empty adjectives. He is not a man of his word or of words as markers of truth. If he wins the presidency (which seems improbable), the Mexican government will have to weigh the dimensions of this historic error, widely denounced in Mexico all across the political spectrum. From Trump, Mexico received only words, words worth no more than the paper they were scribbled on. In exchange, Mexico, filling the sad role of the useful idiot, gave a bigot the pat on the back that he required.